One of the best movie comedies I have ever seen. 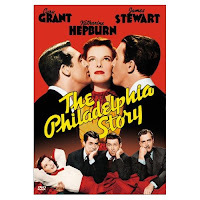 Tracy Lord (Katharine Hepburn) is a high society woman who is about to be married. The only problem she has is her ex-husband, C.K. Dexter Haven (Cary Grant). It seems that he is bound and determined to ruin her big day. He has returned from South America and is summoned to the office of the editor of Spy magazine, Sidney Kidd. Kidd wants to get the scoop on Tracy's wedding and sees Dexter as his ticket in. Kidd has Dexter help his reporter Macaulay "Mike" Connor (James Stewart) and photographer Liz Imbrie (Ruth Hussey) pose as friends of Tracy's brother who can not attend the wedding. Of course when Tracy sees Dexter she gets very upset. She is even more angry when he tells her that Mike and Liz are there for the scoop on his nuptials. Mostly she is upset because her father has run away to New York with a dancer and she does not want her family embarrassed. As she tries to fool the reporter she learns that she may not be the wonderful person she thinks she is. Now she is falling in love with Mike and is not sure what to do about her fiance George. This movie was incredibly funny and touching. The acting was wonderful by all the stars but I loved Stewart's performance the best. The scenes where he is drunk are hilarious. Most people think of Jimmy as a serious actor but he obviously had a funny side also. I think he deserved the Oscar for this role and that his win was just not a make up for him not winning the year before for Mr Smith Goes to Washington. Hepburn was also wonderful as the snobby Tracy who learns the truth about herself. There were two remakes of this movie. There was a made for TV version in 1959 starring Gig Young (Dexter) and Christopher Plummer (Mike). Also, there was High Society in 1956 starring Bing Crosby (Dexter), Frank Sinatra (Mike) and Grace Kelly (Tracy). However, if you want a touching love story that is also very funny watch the original.